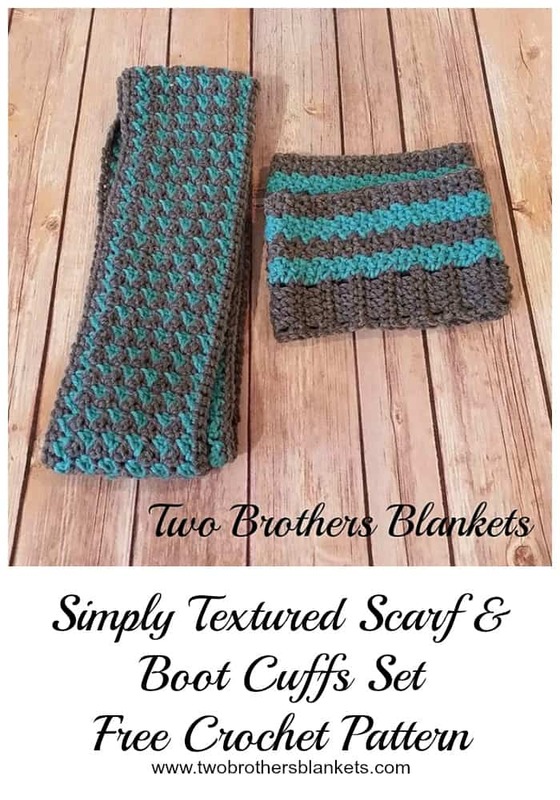 Two Brothers Blankets - Page 8 of 10 - Modern, Stylish, and Simple Crochet Patterns! I’m so excited to share my latest crochet pattern release with you today! 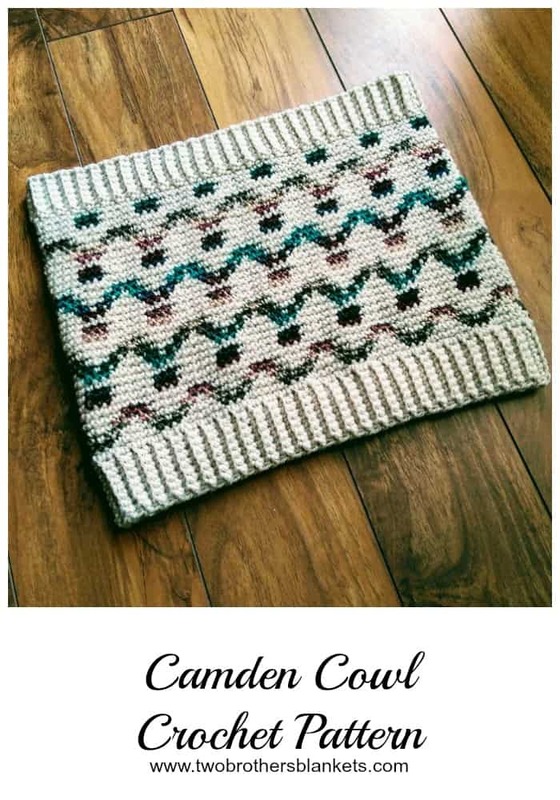 The Camden Cowl is the matching cowl to the Camden Hat! This set is great for kids and adults alike Making the set is just as fun as wearing it! Both the Camden Hat and the cowl use a technique called Fair Isle Crochet. You basically use two colors to create a picture with your yarn. But instead of working over you unused yarn, like tapestry crochet, you carry the unused yarn behind your work. Both patterns come with written instructions, photo tutorials, links to video tutorials, and a chart to follow. So even if you’ve never tried it before, you can master Fair Isle Crochet with these patterns! I used Red Heart Soft yarn from Micheal’s Stores to create the Camden Cowl. 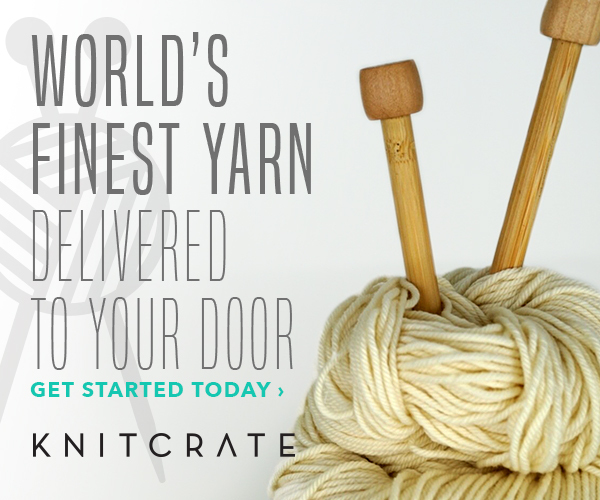 You can use any worsted weight yarn you like, and the color possibilities are endless! What color combo would you use to create yours? Go HERE to purchase the pattern on Ravelry! Go HERE to purchase the pattern on Etsy! I finally decided to name a hat after myself! 😉 The Michelle Hat is such a fun hat! 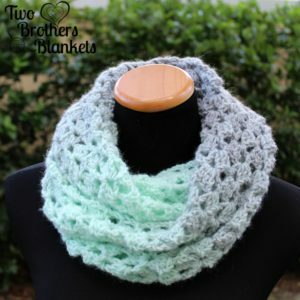 Make this in a solid color or in a self-striping color and it looks beautiful either way! Lots of great texture and lots of ways to give this hat a different look! Pattern comes with sizes 0-6 months all the way to adult! You can purchase the ad-free, printable pdf version on Ravelry or Etsy! Starting chain does not count as first st, unless stated otherwise within the pattern. Pattern is written in size 0-6 months with additional sizes in parentheses. Final stitch count for all sizes is in parentheses at the end of each row/round. Rows 3- 48(56, 64, 68, 76, 80): Repeat row 2. Slip stitch the ends together to create a circle. Now turn the band to the other side, which will be your right side. Do not fasten off. Continue to Body of Hat. Rounds 5 – 7(11, 13, 15, 15, 17): Repeat rounds 3 and 4. Fasten off leaving a long tail to sew top shut. With tapestry needle, weave tail in and out of the stitches and pull tight to close. Weave in ends. Add pom pom to top of hat if desired. Purchase the ad-free pdf pattern HERE. To make bigger or smaller, chain by multiples of 4 + 1. You can also go down a hook size to make just slightly smaller. DO NOT leave child unsupervised when wearing this bow tie. Starting chain does not count as first stitch, unless stated otherwise within the pattern. Ch 1, turn, sc evenly around the entire rectangle, working 2 sc into each corner, join to 1st st, fasten off. Weave in ends. Attach button to side of tie opposite of button hole. Use a long piece of yarn and your tapestry needle and weave yarn down the middle of the bow. 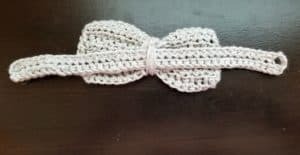 Now place the tie on the back side of the bow and wrap your yarn around the bow and the tie. Tie a know to secure. Fasten off. Weave in all ends. 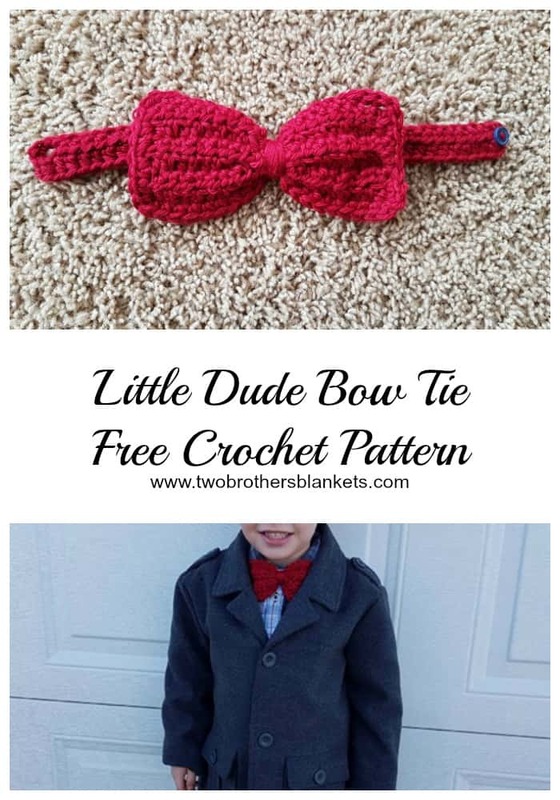 Check out the Dude Blanket crochet pattern, which uses the same stitch combo! 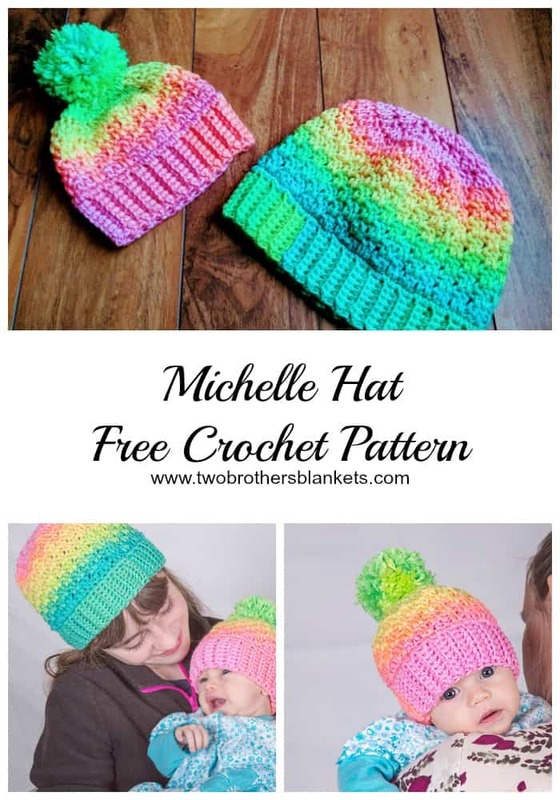 Winter Wear FREE Pattern Roundup! It is still extremely cold in many parts of the world right now so winter wear is a must! 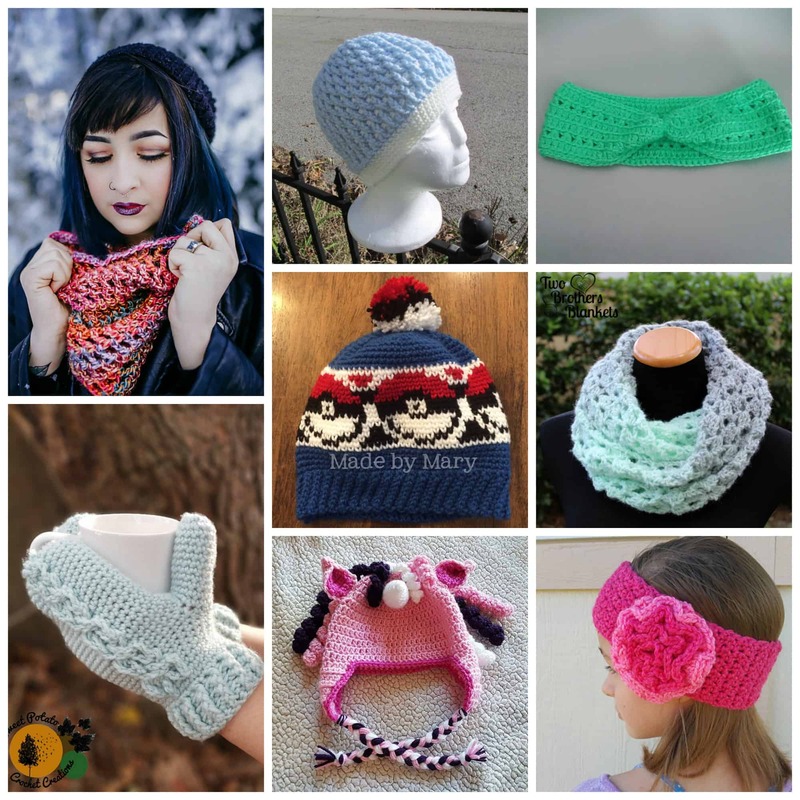 Enjoy these 8 FREE crochet patterns that will keep you warm and cozy! 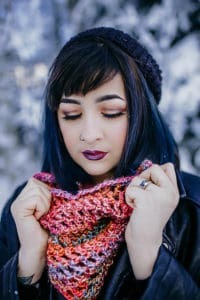 1.The Abby Cowl is a new cowl pattern from KMT Creations! You can grab the free pattern from her blog or purchase the PDF from Ravelry! 2. 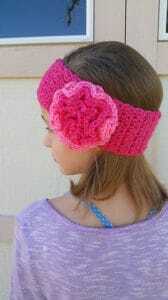 The Winter Rose Earwarmer is a super cute design by Butterfly Dreams Crochet and Crafts! 3. The Corrugated Cap Crochet Pattern is free for only a limited time by Grammy Dirlam! 4. 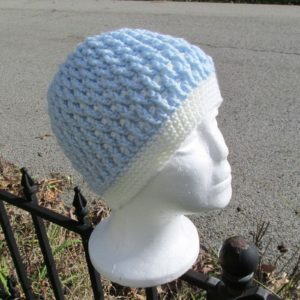 The X Band by Little Red’s Handmade Creations is a quick workup that will keep your ears nice and warm! 5. 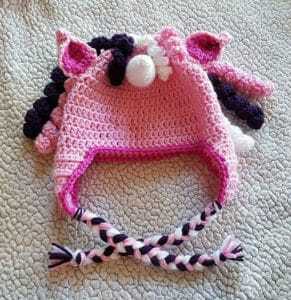 The Unicorn Hat by Snuggly Fox Designs is one the girls will love! 6. 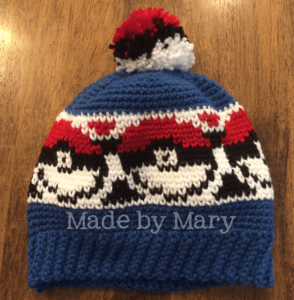 The Pokeball Beanie by Made by Mary is a great one for the boys! 7. 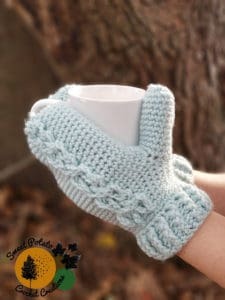 The gorgeous Faux Cabled Mittens by Sweet Potato Crochet Creations will keep your hands warm! 8. 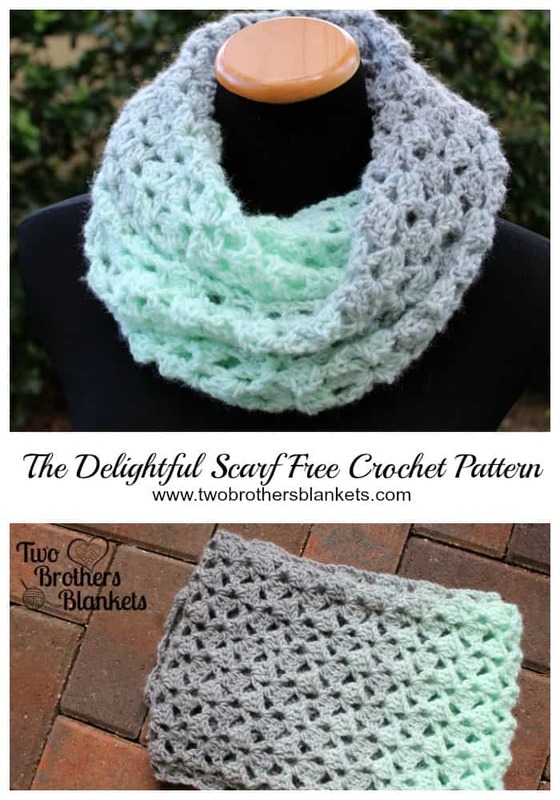 The Delightful Scarf by Two Brothers Blankets is soft and cozy! 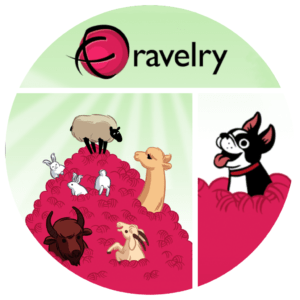 Enjoy these free designs and be sure to share your projects on Ravelry! 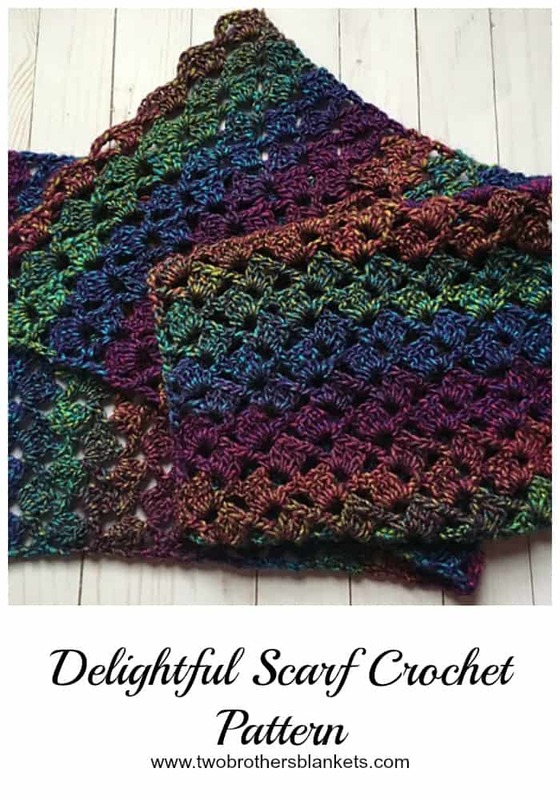 The Delightful Scarf is a quick and easy workup that is great for gifts, craft fairs, or just for yourself! This is an easy pattern that most anyone with basic crochet skills should be able to work! The Delight Scarf uses the Lion Brand Yarn Scarfie line which is a #5 bulky weight and has 312 yards. You only need one skein to make this scarf, but the Scarfie line comes in so many fun color combinations that you will have trouble deciding on only one! The Delightful Scarf is just that! Delightful! I hope you enjoy making it as much as I did. You can purchase the ad-free, printable pdf version of the pattern on Ravelry or Etsy! Gauge is not necessary, but width of scarf should be approximately 11” across. Starting chain counts as first stitch unless stated otherwise throughout the pattern. Scarf is not written as an infinity scarf. To make it an infinity scarf just use a yarn needle and a long piece of yarn to sew your two ends together. Repeat row 2 until scarf reaches 56” or desired length. Pattern is a copyright of Two Brothers Blankets. Please do not alter, copy, share, or sell in any way. You may, however, sell your finished products from this pattern. The Boston stitch combo provides such amazing texture I can’t stop designing patterns with it! 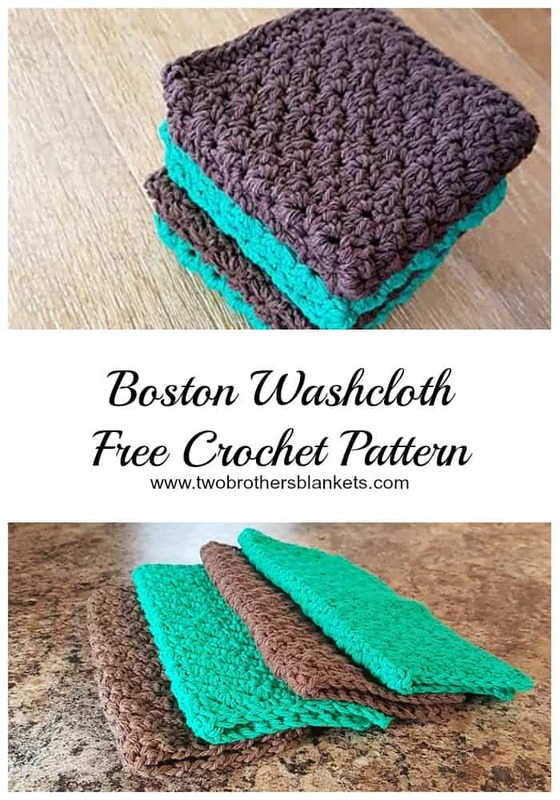 I LOVE a good textured washcloth so I used the same stitch combo to create the Boston Washcloth! This washcloth has such great texture that is perfect for washing dishes! 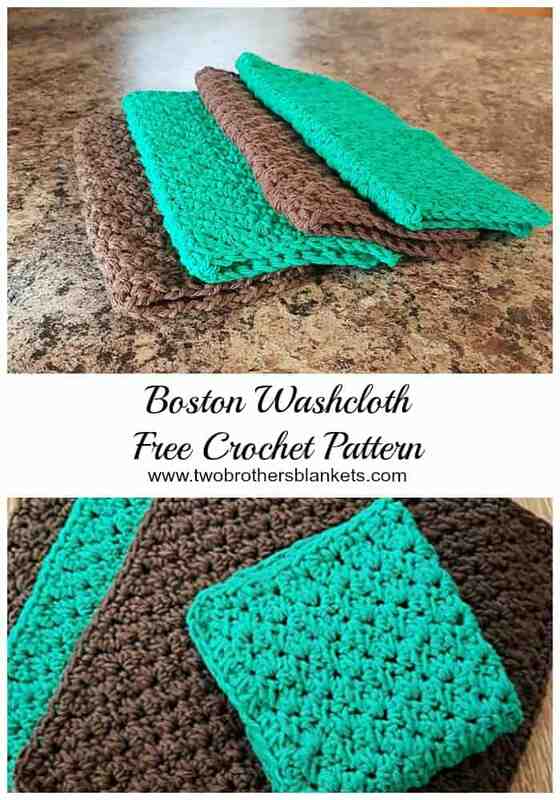 The Boston Washcloth is a free crochet pattern for everyone to enjoy! Please do not copy, alter, or sell this pattern or the photos in this pattern. However, please feel free to share the link to the pattern on social media, Pinterest, and with your crocheting friends so they can visit and make the washcloth themselves! You are also welcome to sell your finished products created from this pattern, just please use your own photos and provide the link for pattern credit. You can purchase the ad-free, printable pdf version of the pattern on Ravelry and Etsy! Turning chain 1 does not count as first stitch. Starting fsc can also be: ch 38, sc in 2nd ch from hook and across. Repeat row 3 until 9” high. SC evenly around entire square working 2 sc in each corner. 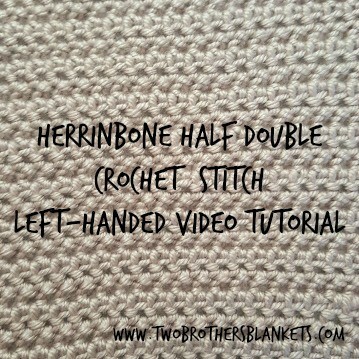 Herringbone Half Double Crochet Stitch and Herringbone Half Double Crochet Decrease- Video Tutorials! I have a few patterns that use the herringbone half double crochet stitch as the main stitch. So I thought it was high time I make a video tutorial for it! My brand new Charlotte Cardigan crochet pattern is one of those designs that uses this stitch, as well as a hhdc2tog (herringbone half double crochet 2 together) decrease. So I’ve made a video for both! 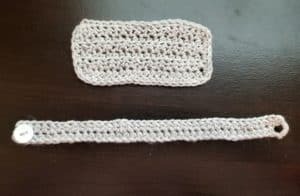 I am left-handed, so this tutorial will be slightly easier to follow for left-handed crocheters, but the steps are exactly the same for right-handed crocheters, just worked in the opposite direction! I hope you find these tutorials helpful! If at anytime you have any questions, please feel free to contact me! Red Heart has recently come out with a new yarn and when it went on sale at Micheal’s I knew I had to check it out! I knew I loved Red Heart Soft, a worsted weight yarn, so I had a feeling I would love the new Red Heart Soft Essentials Yarn too! This yarn holds to it’s name. It is very soft! It’s also not a very thick bulky. I’d compare it to holding two strands of worsted weight yarn together. It’s not very heavy at all. When I purchased it I knew exactly what I wanted to make with it. So I brought it home and got to work. This yarn is very easy to work with. It glides through the stitches very smoothly with no snagging and very little pilling. I really enjoyed working with it. The end result turned out beautifully! Introducing the Charlotte Cardigan! I knew when I saw and felt the Soft Essentials yarn that I wanted to design a cardigan! It just had that cozy feel to it that would be perfect for a simple cardigan. 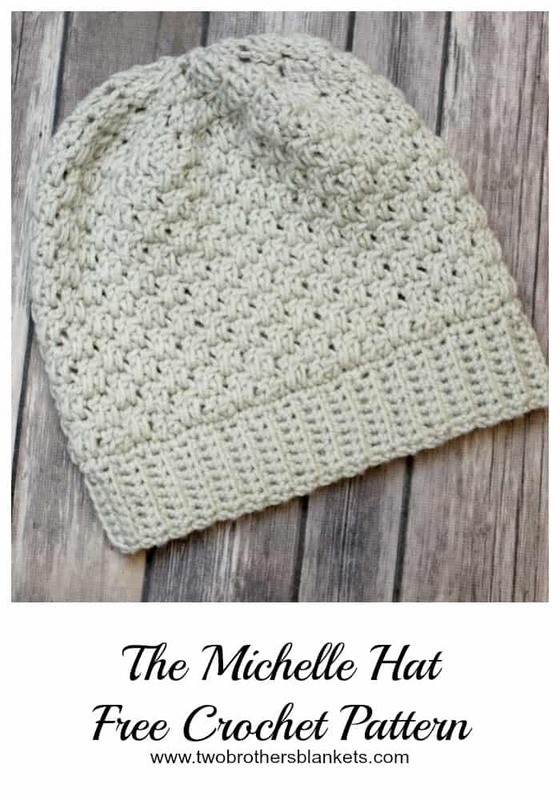 This crochet pattern comes with instructions for women’s sizes XS through 2X. It is a top down pattern with trim and sleeves added at the end. 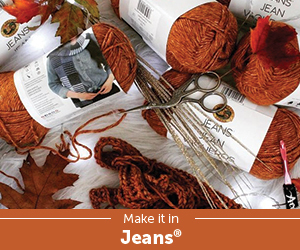 It is sew free, except for a small amount of stitching at the pockets, which are optional. 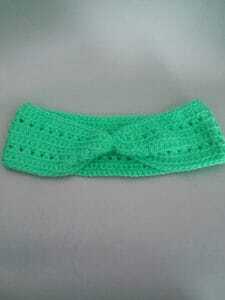 The design uses the herringbone half double crochet stitch, which I have a tutorial for here. 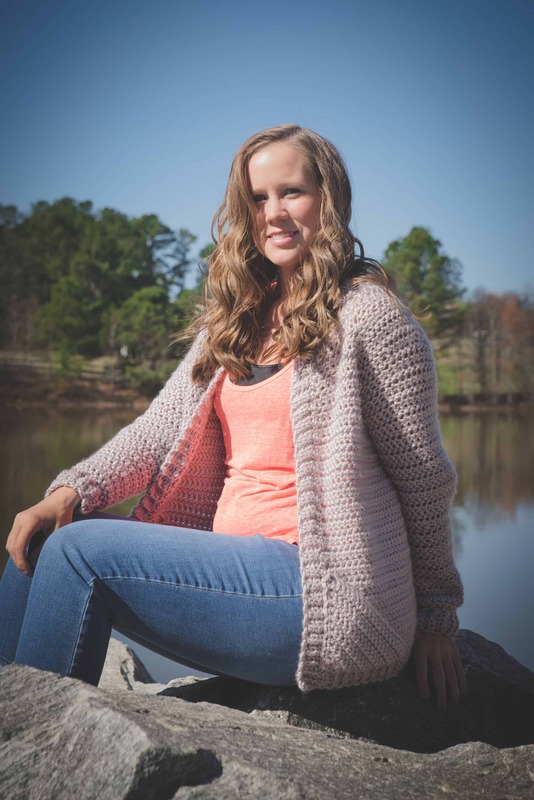 This cozy cardigan is perfect for the cool spring mornings and evenings that are coming. And this yarn is the perfect yarn for it! 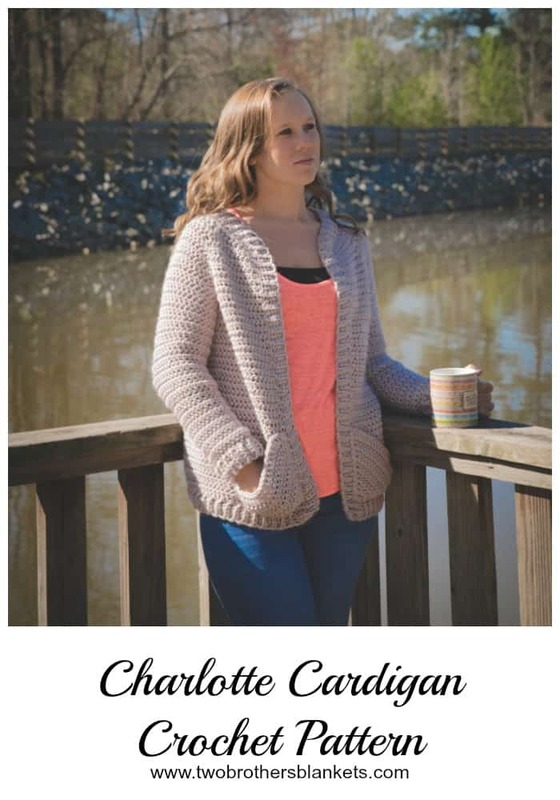 You can purchase the Charlotte Cardigan crochet pattern on Ravelry and Etsy! 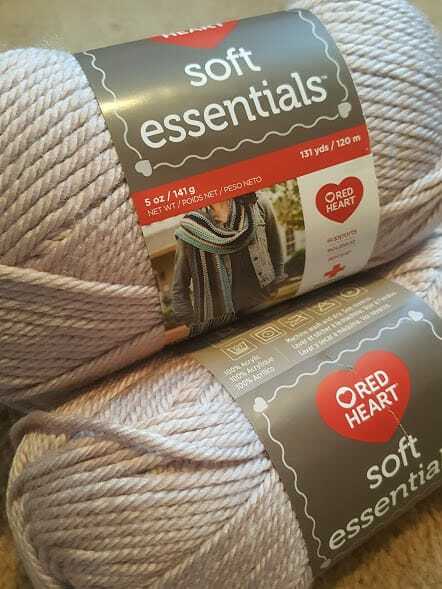 Have you tried Red Heart’s Soft Essentials yarn yet? If so, leave me a comment and let me know what you think of it! I am so excited to once again be featured in Crochetville’s National Crochet Month designer feature! Every day this month they are featuring crochet designers, yarn/crochet product companies, and local yarn stores around the US! 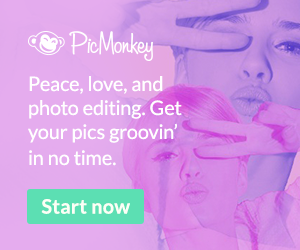 To celebrate my feature on the site and National Crochet Month, I’m offering a special deal! When you purchase one pattern in my Ravelry Shop, you’ll get one free! No exclusions, no limits! 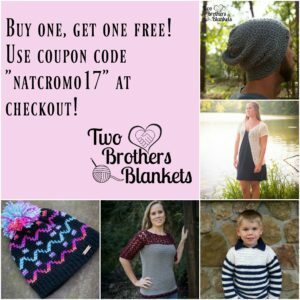 Just use coupon code “NatCroMo17” at checkout! This code is good through March 10, 2017! Thanks for helping me celebrate National Crochet Month! The Simply Textured Scarf and Boot Cuffs Set is one of my very first patterns, and I’ve finally transferred it here to my website! 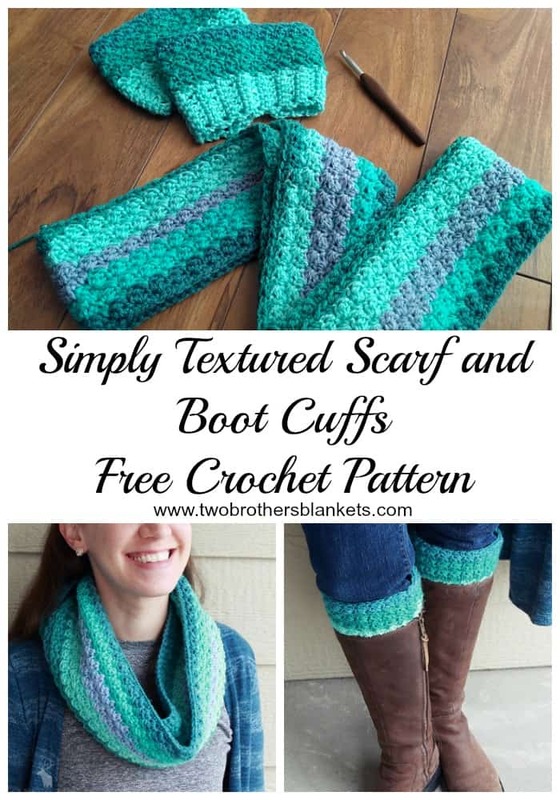 This super cute and simple textured infinity scarf and boot cuff set is sure to be a crowd pleaser! 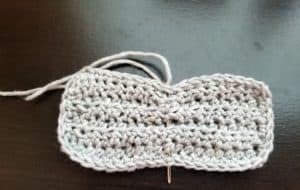 It’s a very easy pattern that even beginners can follow using just the single crochet stitch and the double crochet stitch! Both pieces work up quick making it great for craft shows and/or gifts! I hope you enjoy and please share with your crocheting friends as well. 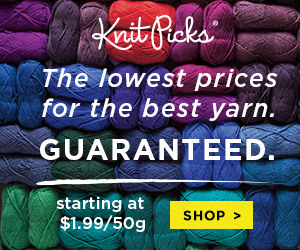 One skein or less of two or more colors of worsted weight yarn. (I used Loops and Threads Impeccable). Gauge is not necessary for this particular pattern. Directions for adjusting the size of the boot cuffs are at the bottom of the pattern. Row 1: SC in 2nd Ch from hook and across, ch 1, turn. Change to Color B here. Row 2: sk 1st st, *1 SC in next st, 1 DC in same st, sk next st*, repeat across, ch 1, turn. Change back to Color A and alternate colors for each row. Row 12: With Color A sc in first st and in each st around. For 14-16” circumference boot cuffs.With size I crochet hook. Finish off, leaving long tail for sewing. With a darning needle stitch together the ends making a circle. With Color B, join to circle on one side and ch 1. Round 1: SC 45 around, join with sl st. Round 3: Ch 1, sk 1st st, *1 SC in next st, 1 DC in same st, sk next st* repeat around, join with sl st. Round 4: Ch 1, sk 1st st, *1 SC in next st, 1 DC in same st, sk next st*, repeat around, join with sl st. Change to Color B. Round 5: Ch 1, sk 1st st, *1 SC in next st, 1 DC in same st, sk next st* repeat around, join with sl st. Round 7: Ch 1, sk 1st st, *1 SC in next st, 1 DC in same st, sk next st* repeat around, join with sl st. Round 8: Ch 1, sk 1st st, *1 SC in next st, 1 DC in same st, sk next st*, repeat around, join with sl st.